If you’re a dietitian who loves to cook, and lives in an “average” sized NYC apartment (we’re talkin’ no more than 600 square feet), I’m sure you feel my pain when it comes to kitchen space. When you only have 4 cabinets and 2 drawers, with about a 3 feet long by 1 foot wide counter work space, you learn how to minimize and become quite efficient. Many of my kitchen tools are collapsible (strainers, prep bowls, and yes, even my salad spinner folds into itself), it takes me about 3 minutes to pull out pans and cookie sheets before getting to the crockpot, and my larger appliances don’t even get to live in the kitchen- the large Cuisinart food processor sits in its box in the dining area. Let’s just say, of gadgets I have few. Rather my kitchen serves a practical purpose, and there’s some tools I just can’t do without. It’s not much, but it’s my home kitchen. 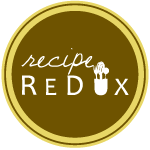 While all of the other reindeer wouldn’t let Rudolph play any games, the creators of The Recipe Redux are inviting us to join in on a holiday foodie game called “Grab a Book and Cook”. The challenge is to grab a cookbook and ReDux the recipe on any page that is a combination of the numbers “2017”.